BenQ claims that these are world’s first 4K DLP projectors that feature up to 100 percent DCI-P3 cinematic colours with projector-optimized HDR-PRO support and individual factory colour calibration. 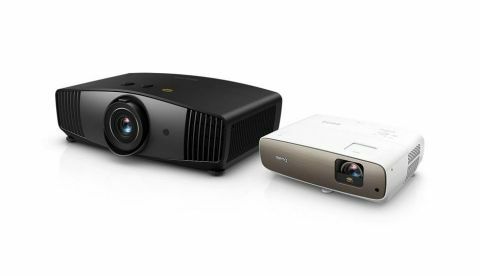 Expanding its home cinema line of projector category, Taiwanese tech company BenQ has launched the CinePrime W5700 and the W2700 DLP projectors in India. The company claims that these are the world’s first 4K home theater DLP projectors that feature DCI-P3 colour with projector-optimised HDR-PRO support and individual factory colour calibration. The BenQ CinePrime W2700 is now available at a price of Rs 2.49 lacs and the W5700 will start shipping soon at the price of Rs 2.99 lacs. “BenQ continues to be the market leader with maximum market share in 4K projector segment in Asia Pacific and India markets. Today, we have unveiled W5700 and W2700 projectors which are specially designed for budding movie fanatics to real enthusiast-level cinema lovers. With this new range of 4K projectors, we are extremely optimistic that these will turn any room into a world-class home theater with video-enhancing technologies,” Rajeev Singh, Managing Director, BenQ India, said in a statement. The BenQ W2700 4K HDR CinePrime projector is said to be an ideal fit for a small living room and the W5700, with a 1.6X zoom and 2D H/V lens shift, is claimed to be perfect for AV rooms. Both of them feature DCI-P3 industry standard colours and offer 3840x2160 pixel resolution with 8.3 million distinct pixels for each frame. BenQ says that the projectors utilise the 4K-optimised optical system with six structured groups of all-glass lens elements to deliver clear and sharp images across the screen. The projectors also leverage the BenQ-exclusive CinematicColor technology allowing the W5700 to provide 100 percent coverage of the super wide DCI-P3 colour space and 100 percent of Rec. 709. The same tech allows the W2700 to cover 94 percent of DCI-P3 and 100 percent of Rec. 709. As mentioned, these projectors come with proprietary HDR-PRO technology specifically optimised for projection. BenQ says that the HDR-PRO technology supports both HDR10 and HLG formats and incorporates auto colour and tone mapping techniques to offer brightness and contrast ranges as well as ideal image optimisation. These projectors also have BenQ proprietary CinemaMaster Video+ technology brings commercial quality digital cinema images with motion-adaptive 4K pixel enhancement, colour enhancement, and natural flesh tone rendition.